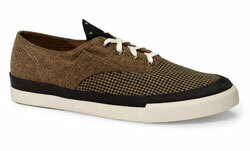 Keds has been around since 1916 and claims to be the "first national athletic and lifestyle footwear brand" in the US. We’re not going back that, we’re going back to 1926 for the Keds Triumph Clockwork trainers. The Triumph range dates back 80 years and has been re-introduced in a slightly updated design with a number of different looks. The Clockwork is the real eye-catcher, a gentleman’s shoe with its tweed/suiting upper and men’s tie tongue, but still maintaining the rubber sole. If all that’s a bit much, you’ll be pleased to know there’s more basic designs in the range, including plain black and white. Available now for $55, which is around £30.